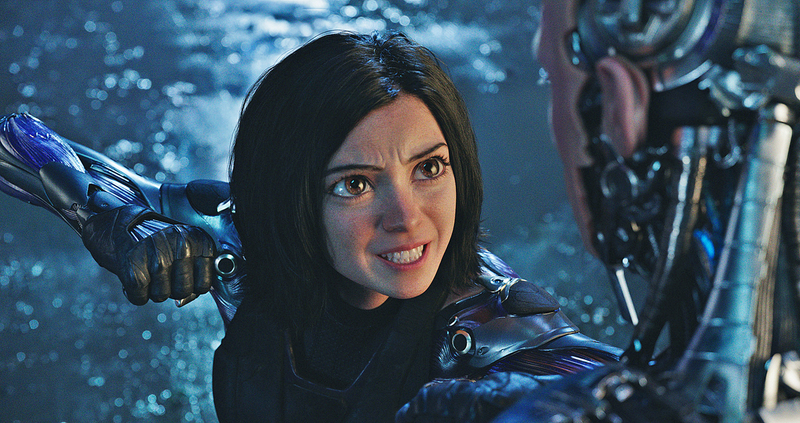 The brisk and entertaining “Alita: Battle Angel” took a decades-long path to the Hollywood screen. It’s a heartfelt moment of new love designed to be a weighty plot turn, but it’s a development that was beyond predictable, almost impatiently expected. “Alita: Battle Angel,” the big-screen adaptation of Yukito Kishiro’s cyberpunk graphic novels of the early 1990s, has little in the way of new and inventive plot or visual innovations, but it survives on a great deal of heart – a cyboric heart, at that. The post-apocalyptic series was set in a not-too-distant future, in which your neighbor next door might be a person, a robot, or some hybrid thereof. The story caught the eye of director James Cameron around that time, and he long since envisioned a big-screen adaptation. Unfortunately for the 2019 iteration, the wheels of progress – and completion – are crushingly slow in Hollywood. The resulting passing of time renders “Alita: Battle Angel” a film based on themes and visions we’ve seen many times before – and will likely see again, as it obviously sets up for a sequel. Not that it’s a bad movie, not by any measure. The story moves along briskly, and benefits tremendously by the performance of a barely-recognizable Rosa Salazar, known for her work in “American Horror Story.” She’s a fine choice for the role, lending a very human vulnerability and depth to what could have been a mechanically plastic personification. Cameron didn’t direct this movie – leaving those duties to Robert Rodriguez – but his fingerprint is all over it. The CG technology that wowed us a decade ago in “Avatar” returns in reduced effect for Alita, whose appearance takes some time for acclimation. Her appearance lies somewhere between a classic Japanese manga character, with huge doe-eyes and perfectly tapered chin, and some kind of hyper-sexualized anime doll. None of the other characters have such a design. The story begins when Alita – or the bare remnants of her – are found in a pile of junked spare parts by robotics techno wizard Dr. Dyson Ido, played by the always engaging Christoph Waltz. Still grieving for his murdered teenage daughter, he rebuilds the cyborg using Alita’s surviving brain and a robotic body he had designed for eventual use by the wheelchair-bound child he lost. Almost immediately, Alita – in the movie, she’s named after the late daughter – is grappling with an identity crisis, assuming it’s amnesia. As the story moves on, she gradually regains some memories of who she was in her mechanized life – an interplanetary warrior of some sort – and develops more as a caring, feeling human being. The original story, while set in mostly U.S. locations, had several Japanese characters. Dr. Ido was originally Daisuke Ido, and the person/cyborg who became Alita might have been previously named Yoko. However, the heritage of those characters is absent in the Hollywood version, a topic that will be discussed in a forthcoming Rafu article. Entertaining and thrilling in spots, “Alita: Battle Angel” will inevitably be compared to “Ghost in the Shell,” but this surpasses that 2017 disappointment on the strength of its starring performer – who had to do all of her work in a motion-capture suit. Salazar retains a bewilderment and a tenderness that brings Alita alive from the scrap heap. And in a movie filled with somewhat dated ideas, that’s a good way to stand out. “Alita: Battle Angel” opens in wide release today. Rated PG-13, 122 minutes.